I'm calling out to my local cycling friends to pledge a tax-deductible contribution towards sponsoring a Park Bench to be installed at a prominent location at Brook Run Park. It will be labeled as being donated by Dunwoody Cycling. Help generate some goodwill & give back to our community. Our parks and open spaces are part of what makes Dunwoody exceptional. 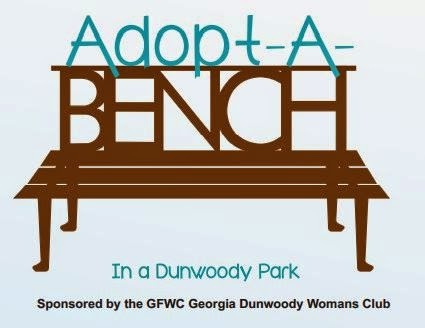 The Dunwoody Women's Club is coordinating the purchase & installation of Park Benches throughout our public parks. Each bench costs $1,000. To make the pledge, please fill out your information at the following link. I'll let the pledge period continue until Friday, May 2nd. Once we reach our goal, I'll notify you & you can make a TAX-DEDUCTIBLE check payable to "Dunwoody Women's Club" and mail it to me for processing. The Dunwoody Woman's Club is pleased to support the City of Dunwoody Parks and Recreation Department's goal to provide the residents of Dunwoody with the highest quality parks, recreational services, and green space to enhance the quality of life in our community. People of all ages visit our parks on a daily basis for athletic sports, playground activities, events, other gatherings, and neighborhood activities. Many come to the parks to relax and get away from the stresses and pressures of everyday life. Whatever the reason for visiting our parks, your tax-deductible gift of a park bench will be recognized and appreciated by thousands who visit each year.